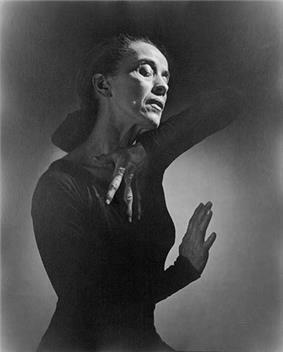 Martha Graham (May 11, 1894 – April 1, 1991) was an American modern dancer and choreographer whose influence on dance has been compared with the influence Picasso had on the modern visual arts, Stravinsky had on music, or Frank Lloyd Wright had on architecture. Graham was born in Victorian era was known as an "alienist", a practitioner of an early form of psychiatry. The Grahams were strict Presbyterians. Dr. Graham was a third-generation American of Irish descent. Her mother Jane Beers was a second-generation American of Irish and Scots-Irish descent and was also a sixth-generation descendant of Myles Standish. While her parents provided a comfortable environment in her youth, it was not one that encouraged dancing. The Graham family moved to Santa Barbara, California when Martha was fourteen years old. In 1911, she attended the first dance performance of her life, watching Ruth St. Denis perform at the Mason Opera House in Los Angeles. In the mid-1910s, Martha Graham began her studies at the newly created Denishawn School of Dancing and Related Arts, founded by Ruth St. Denis and Ted Shawn, at which she would stay until 1923. In 1922, Graham performed one of Shawn's Egyptian dances with Lillian Powell in a short silent film by Hugo Riesenfeld that attempted to synchronize a dance routine on film with a live orchestra and an onscreen conductor. In 1925, Graham was employed at the Eastman School of Music where Rouben Mamoulian was head of the School of Drama. Among other performances, together Mamoulian and Graham produced a short two-color film called The Flute of Krishna, featuring Eastman students. Mamoulian left Eastman shortly thereafter and Graham chose to leave also, even though she was asked to stay on. In 1926, the Martha Graham Center of Contemporary Dance was established. On April 18 of the same year Graham debuted her first independent concert, consisting of 18 short solos and trios that she had choreographed. This performance took place at the 48th Street Theatre in Manhattan. She would later say of the concert: "Everything I did was influenced by Denishawn." On November 28, 1926 Martha Graham and others in her company gave a dance recital at the Klaw Theatre in New York City. Around the same time she entered an extended collaboration with Japanese-American pictorialist photographer Soichi Sunami, and over the next five years they together created some of the most iconic images of early modern dance. One of Graham's students was heiress Bethsabée de Rothschild with whom she became close friends. When Rothschild moved to Israel and established the Batsheva Dance Company in 1965, Graham became the company's first director. In 1936, Graham created Chronicle which brought serious issues to the stage in a dramatic manner. Influenced by the Wall Street Crash of 1929, the Great Depression that followed, and the Spanish Civil War, the dance focused on depression and isolation, reflected in the dark nature of both the set and costumes. In 1938 Erick Hawkins became the first man to dance with her company. He officially joined her troupe the following year, dancing male lead in a number of Graham's works. They were married in July 1948 after the New York premiere of Night Journey. He left her troupe in 1951 and they divorced in 1954. Graham collaborated with many composers including Aaron Copland on Appalachian Spring, Louis Horst, Samuel Barber, William Schuman, Carlos Surinach, Norman Dello Joio, and Gian Carlo Menotti. Graham's mother died in Santa Barbara in 1958. Her oldest friend and musical collaborator Louis Horst died in 1964. She said of Horst, "His sympathy and understanding, but primarily his faith, gave me a landscape to move in. Without it, I should certainly have been lost." Throughout her career Graham resisted requests for her dances to be recorded because she believed that live performances should only exist on stage as they are experienced. There were a few notable exceptions to her dances being taped. For example, she worked on a limited basis with still photographers Philippe Halsman's photographs of "Dark Meadow" the most complete photographic record of any of her dances. Halsman also photographed in the 1940s: "Letter to the World", "Cave of the Heart", "Night Journey" and "Every Soul is a Circus". In later years her thinking on the matter evolved and others convinced her to let them recreate some of what was lost. In her biography Martha Agnes de Mille cites Graham's last performance as the evening of May 25, 1968, in a "Time of Snow". But in A Dancer's Life biographer Russell Freedman lists the year of Graham's final performance as 1969. In her 1991 autobiography, Blood Memory, Graham herself lists her final performance as her 1970 appearance in Cortege of Eagles when she was 76 years old. It wasn't until years after I had relinquished a ballet that I could bear to watch someone else dance it. I believe in never looking back, never indulging in nostalgia, or reminiscing. Yet how can you avoid it when you look on stage and see a dancer made up to look as you did thirty years ago, dancing a ballet you created with someone you were then deeply in love with, your husband? I think that is a circle of hell Dante omitted. [When I stopped dancing] I had lost my will to live. I stayed home alone, ate very little, and drank too much and brooded. My face was ruined, and people say I looked odd, which I agreed with. Finally my system just gave in. I was in the hospital for a long time, much of it in a coma. Guide to the Barbara Morgan Photographs of Martha Graham and Company. Special Collections and Archives, The UC Irvine Libraries, Irvine, California. Hodes, Stuart, Part Real-Part Dream, Dancing With Martha Graham, (2011) Concord ePress, Concord, MA. Bird, Dorothy; Greenberg, Joyce (2002). Bird's Eye View: Dancing With Martha Graham and on Broadway (reprint ed.). Pittsburgh, Pennsylvania: University of Pittsburgh Press. Graham, Martha (1991). Blood Memory An autobiography. New York: Doubleday. Hawkins, Erick (1992). The Body Is a Clear Place and Other Statements on Dance. Hightstown, New Jersey: Princeton Book Co.
Horosko, Marian (2002). Martha Graham The Evolution of Her Dance Theory and Training. Gainesville, FL: Univ. Press of Florida. Morgan, Barbara (1980). Martha Graham Sixteen Dances in Photographs. Morgan & Morgan. Newman, Gerald (1998). Martha Graham: Founder of Modern Dance. Danbury, Connecticut: Franklin Watts. Taylor, Paul (1987). Private Domain An Autobiography. New York: Knopf. Tracy, Robert (1997). Goddess – Martha Graham's Dancers Remember. Pompton Plains, New Jersey: Limelight Editions. Layman, Richard; Bondi, Victor (1995). American Decades 1940–1949. Gale Research International, Limited. de Mille, Agnes (1991). Martha: The Life and Work of Martha Graham. New York: Random House. Bryant, Paula Pratt (1994). Martha Graham (The Importance Of... Series). Detroit: Gale. ^ a b Bondi (1995) p.74 quote: "Picasso of Dance [...] Martha Graham was to modern dance what Pablo Picasso was to modern art." ^ a b Agnes de Mille (1991) p.vii quote: "Her achievement is equivalent to Picasso's," I said to Mark Ryder, a pupil and company member of Graham's, "I'm not sure I will accept him as deserving to be in her class." ^ a b "Martha Graham: About the Dancer". American Masters. NPR. September 16, 2005. Archived from the original on 2013-10-10. ^ a b "TIME 100: Martha Graham". Time. August 6, 1998. Archived from the original on 2011-07-06. ^ "from Kathy Muir". Seattle Camera Club. Retrieved 2015-10-04. ^ Franco, Mark (June 2012). 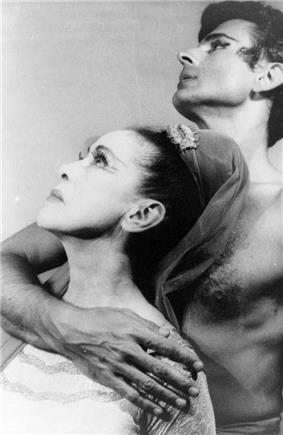 Martha Graham in Love and War: The Life in the Work. Oxford University Press. p. 139. ^ LaMothe, Kimerer L. Nietzsche's Dancers: Isadora Duncan, Martha Graham, and the Revaluation of. p. 203. ^ Dance Observer 27. 1960. ^ Graham, Martha (1991). Blood memory. Doubleday. ^ Kisselgoff, Anna (April 2, 1991). "Martha Graham Dies at 96; A Revolutionary in Dance". The New York Times. ^ Susan Ware (1998). Letter to the World: Seven Women who Shaped the American Century. W.W. Norton. ^ "Google Doodle Celebrates Martha Graham and Dynamic Web". PC World. May 11, 2011. Archived from the original on 2013-07-02. ^ De Mille (1991), p. 409. ^ De Mille (1991), pp. 409–10. ^ Gerald, Newman (1998). Martha Graham: Founder of Modern Dance. Danbury, Connecticut: Franklin Watts. ^ De Mille (1991) p. 264. ^ "Martha Graham Dance Company". Museum of Contemporary Art, Chicago. Archived from the original on 2011-09-19. Retrieved 2011-08-08. ^ Darnell, Tracie (2007-04-17). "Martha Graham Dance Company returns to Chicago for long-awaited performance at MCA". Medill. Archived from the original on 2013-10-12. Retrieved 2011-08-08. ^ "Book of Members, 1780–2010: Chapter G" (PDF). American Academy of Arts and Sciences. Retrieved July 29, 2014. ^ Cross, Mary (ed). One Hundred People who Changed 20th-century America. p. 156. ^ 11:27 p.m. EDT October 3, 2015. "10 women honored at Hall of Fame induction". Democratandchronicle.com. Retrieved 2015-10-04. 1946 Dark Meadow Carlos Chávez Sets by Isamu Noguchi, costumes by Edythe Gilfond, and lighting by Jean Rosenthal. 1978 Flute of Pan Traditional music. In 2015 she was posthumously inducted into the National Women's Hall of Fame. In 1998 Graham was posthumously named "Dancer of the Century" by Time magazine, and one of the female "Icons of the Century" by People. The New York Times called her a "brilliant, young dancer". Graham was inducted into the National Museum of Dance's Mr. & Mrs. Cornelius Vanderbilt Whitney Hall of Fame in 1987. In 1957 Graham was elected a Fellow of the American Academy of Arts and Sciences. She was awarded the Presidential Medal of Freedom in 1976 by President Gerald Ford (the First Lady Betty Ford had danced with Graham in her youth). Ford declared her "a national treasure". Graham's original female dancers consisted of Bessie Schonberg, Evelyn Sabin, Martha Hill, Gertrude Shurr, Anna Sokolow, Nelle Fisher, Dorothy Bird, Bonnie Bird, Sophie Maslow, May O'Donnell, Jane Dudley, Anita Alvarez, Pearl Lang, and Marjorie G. Mazia. A second group included Yuriko, Ethel Butler, Ethel Winter, Jean Erdman, Patricia Birch, Nina Fonaroff, Matt Turney, Mary Hinkson. The group of men dancers was made up of Erick Hawkins, Merce Cunningham, David Campbell, John Butler, Robert Cohan, Stuart Hodes, Glen Tetley, Bertram Ross, Paul Taylor, Mark Ryder, and William Carter. The Martha Graham Dance Company is the oldest dance company in America, founded in 1926. It has helped develop many famous dancers and choreographers of the 20th and 21st centuries including Erick Hawkins, Anna Sokolow, Merce Cunningham and Paul Taylor. It continues to perform, including at the Saratoga Performing Arts Center in June 2008, a program consisting of: Ruth St. Denis' The Incense; Graham's reconstruction of Ted Shawn's Serenata Morisca; Graham's Lamentation; Yuriko's reconstruction of Graham's Panorama, performed by dancers from Skidmore College; excerpts from Yuriko's and Graham's reconstruction of the latter's Chronicle from the Julien Bryan film; Graham's Errand into the Maze and Maple Leaf Rag. The company also performed in 2007 at the Museum of Contemporary Art, Chicago, with a program consisting of: Appalachian Spring, Embattled Garden, Errand into the Maze, and American Original. The greatest thing [Graham] ever said to me was in 1943 after the opening of Oklahoma!, when I suddenly had unexpected, flamboyant success for a work I thought was only fairly good, after years of neglect for work I thought was fine. I was bewildered and worried that my entire scale of values was untrustworthy. I talked to Martha. I remember the conversation well. It was in a Schrafft's restaurant over a soda. I confessed that I had a burning desire to be excellent, but no faith that I could be. Martha said to me, very quietly: "There is a vitality, a life force, an energy, a quickening that is translated through you into action, and because there is only one of you in all of time, this expression is unique. And if you block it, it will never exist through any other medium and it will be lost. The world will not have it. It is not your business to determine how good it is nor how valuable nor how it compares with other expressions. It is your business to keep it yours clearly and directly, to keep the channel open. You do not even have to believe in yourself or your work. You have to keep yourself open and aware to the urges that motivate you. Keep the channel open... No artist is pleased. [There is] no satisfaction whatever at any time. There is only a queer divine dissatisfaction, a blessed unrest that keeps us marching and makes us more alive than the others." Martha Graham has been said to be the one that brought dance into the 20th century. Due to the work of her assistants, Linda Hodes, Pearl Lang, Diane Gray, Yuriko, and others, much of Graham’s work and technique have been preserved. They taped interviews of Graham describing her entire technique, and videos of her performances. As Glen Tetley told Agnes de Mille, “The wonderful thing about Martha in her good days was her generosity. So many people stole Martha’s unique personal vocabulary, consciously or unconsciously, and performed it in concerts. I have never once heard Martha say, 'So-and-so has used my choreography.'" An entire movement was created by her that revolutionized the dance world and created what is known today as modern dance. Now, dancers all over the world study and perform modern dance. Choreographers and professional dancers look to her for inspiration. To celebrate what would have been her 117th birthday on May 11, 2011, Google's logo for one day was turned into one dedicated to Graham's life and legacy. Graham has been sometimes termed the "Picasso of Dance," in that her importance and influence to modern dance can be considered equivalent to what Pablo Picasso was to modern visual arts. Her impact has been also compared with the influence Stravinsky had on music, or Frank Lloyd Wright had on architecture. Graham choreographed until her death in New York City from pneumonia in 1991, aged 96. Just before she became sick with pneumonia, she finished the final draft of her autobiography, Blood Memory, which was published posthumously in the fall of 1991. She was cremated, and her ashes were spread over the Sangre de Cristo Mountains in northern New Mexico.